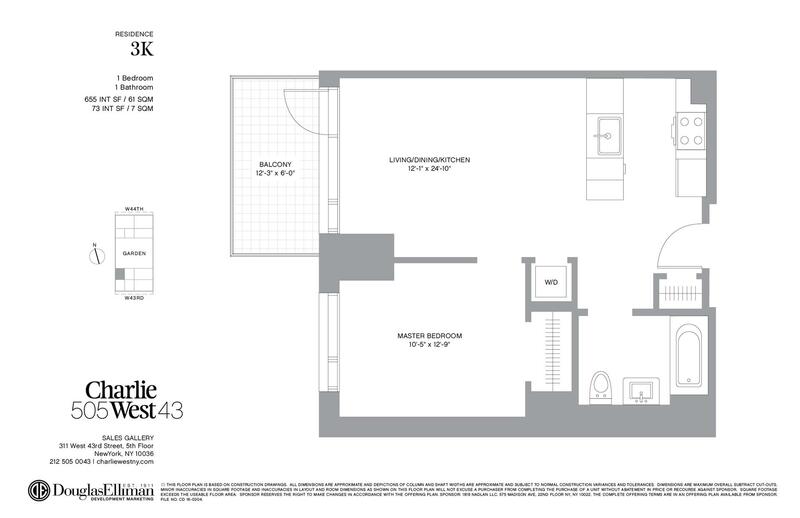 This 1 bedroom 1 bath home features a 73 -square foot balcony conveniently located off your expansive living room which boasts 5" wide plank oak wood flooring throughout an open layout and floor-to-ceiling windows. The custom Scavolini kitchen by Escobar Design features white quartz countertops and backsplashes, wood and lacquered cabinets and is equipped with Bosch and Thermador appliances. The luxurious bathroom is finished with a Herringbone flooring marble stone tile pattern with porcelain tiled walls and fixtures by Toto. A washer and dryer complete this residence. The renderings in this website are artistic illustrations. The inclusion of furniture, furnishings, fixtures and decorations in the renderings of units and common areas are for illustrative purposes only. All units are being offered unfurnished. Sponsor makes no representation that the fit-out of any common areas will be as set forth in these renderings and sponsor makes no representation concerning the views from any unit or common area.Sponsor: 1818 Nadlan LLC. 311 W 43rd Street, 5th Floor, New York, NY, 10036. The complete offering terms are in an offering plan available from sponsor. File No. CD 16-0304.